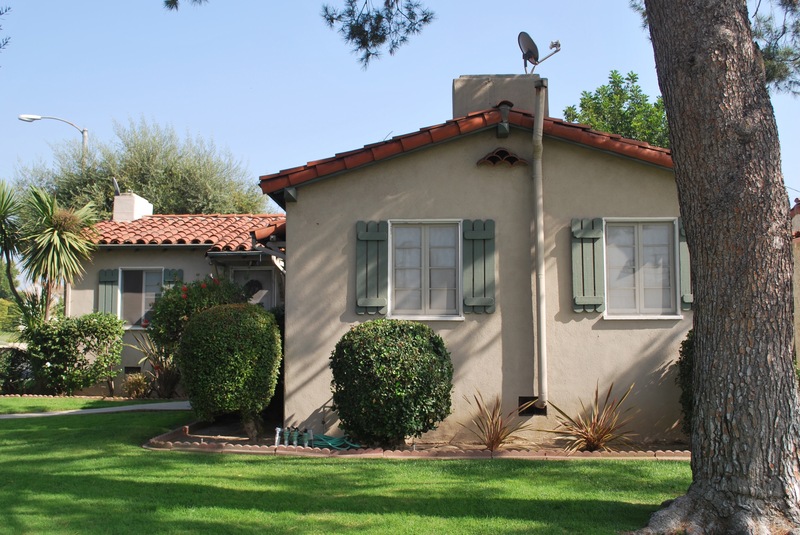 The Spanish Colonial Revival home was built in 1932 by the Foster-Huntley Construction Company of Los Angeles upon land owned by the Huntington Land & Improvement Company. Located just north of the lavish Midwick Country Club, this was land that had been purchased by Henry Huntington for residential development. In keeping with his multi-faceted business model that incorporated transportation, electric power generation and distribution, and real estate development, Huntington’s Pacific Electric Rail Line from Los Angeles to Covina passed just a few hundred yards to the north, with stops nearby at Granada Park, Ethel Avenue and Ramona Convent. The vacant lot on West Hellman Avenue was purchased from Huntington in 1926 by Frank and Charlotte Roth. The Roths were recent arrivals to Southern California from Chicago—part of a huge wave of migration that more than doubled the area’s population in the 1920’s—the largest influx since the Gold Rush. In Chicago, Frank had been employed as a ticket seller for the Pennsylvania Railway. Their new property overlooked the polo field of the Midwick Country Club. After several years of saving, the Roths had accumulated enough money to begin construction. In 1932, during the depths of the Great Depression, they hired the Los Angeles architectural firm of Foster Huntley, Inc., to design and build the house of their dreams. The project was described in the building permit as a seven-room house and garage of lath and plaster, with stucco exterior and a terra cotta tile roof. The approximate cost to build was $4,000. The Roth family continued to live in this home for nearly 40 years. In designing the house, Foster Huntley chose to work in the Spanish Colonial Revival style that was so popular during the 1920s and 30s. Many of the character-defining details of that style are visible in this home: the low horizontal massing; the prominent arched window centered in the front-facing gable, with clay vent pipes above; the arcade entry, comprised of two additional arches, one of which serves as a porte-cochere; tall casement windows in the living and dining rooms; a decorative ironwork gate extending across the driveway; and the low-pitched gable roof clad in terra cotta tiles. 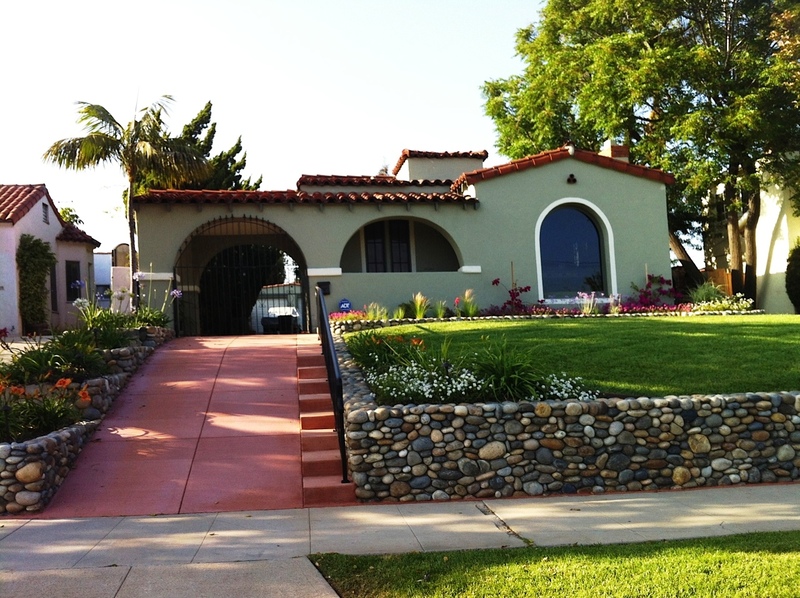 Today, a newly landscaped front garden features river rock walls and Mediterranean plantings. Having purchased the home in 1971, the current owner has now lived there longer than the Roth family, for whom it was originally built. While the house is small by current standards, she loves the fact that it is solid and filled with history and character—elements that are often lacking in modern homes. She especially loves the quality of light that streams in through the large living room windows. Over the years, this homeowner and her husband put considerable work into the house. They remodeled the kitchen and two bathrooms, refinished the hardwood floors, added air conditioning, upgraded the electrical system, and installed new copper pipes. The home was a source of special pride for her husband, who enjoyed sharing photos of their various home improvement projects with friends. So great was this couple’s passion for their home that even a life-threatening illness failed to derail their plans. When, earlier this year, the homeowner’s husband was put on the waiting list for a lung transplant, they painted the exterior and re-landscaped their yard. The homeowner’s hope was that the beautiful new front yard would be the first thing that her husband would see when he returned home from the hospital. Although he did see photos of the work in progress, he never made it home. He died at Barlow Hospital in July—just one day before Alhambra Preservation Group’s letter arrived in the mail, announcing their nomination for a Heritage Home Award. For this proud homeowner, honored with both the APG and Alhambra Beautiful Awards during 2012, this recognition is bittersweet—although, she is certain that her husband is aware of both awards and is, “having a good laugh about it.” In designating this home as a 2012 Heritage Home Award winner, Alhambra Preservation group is proud to recognize, in this couple’s exemplary stewardship of their historic property, a true labor of love. This is the first article in a four-part series highlighting Alhambra Preservation Group’s 2012 Heritage Home Award-winning residences. The apartments are located in the Granada Place Tract, which was developed as a residential neighborhood in the 1920s—the heyday of the nearby Midwick Country Club. The Pacific Electric Railway line, with daily passenger service from Los Angeles to San Bernardino, ran close by, traversing the center of Ramona Road, which is now the San Bernardino Freeway. Atilio and Viola Guardia were the first owners of this apartment complex. The son of Italian immigrants, Atilio had grown up on a farm in Illinois. He and Viola came to Southern California in the mid-1920s, and Atilio was employed as head gardener on the Sierra Madre estate of Grace Hall, an elderly widow. While living in a cottage on the estate, they saved their money and, in the Fall of 1937, purchased a vacant lot in Alhambra and hired a local contractor, Lindsia Elkanah “Caney” Dowell, to draw up plans for a four-unit garden apartment complex. Each of the four apartments had one bedroom and one bathroom. Construction on the small 600-square foot apartments, which were designed in the Spanish style with terra cotta roof tiles, fireplaces and casement windows framed by decorative wood shutters, was completed in early 1938. Over the next 40 years, the Guardias rented to an assortment of hard-working people—laundry drivers, waiters, stenographers, warehousemen, aircraft workers—all of whom called these modest, but attractive, apartments home. The current owners purchased this apartment complex in the early 1980s. Having moved to Alhambra in the 1970s and living in the nearby Midwick Tract, they had often admired this apartment complex as they drove their children to school. When the complex went on the market in 1983, they jumped at the chance to purchased them. These new owners already possessed a well-developed appreciation for historic architecture. (Others among their family have, for many years, owned and maintained an early Los Angeles landmark, El Milagro Market and Albion Cottages, a store and five houses, built circa 1870 for Southern Pacific Railroad workers.) Since 1983, they have maintained the apartments conscientiously, restoring the original wood casement windows and mitigating extensive termite damage and dry rot throughout the complex. Among other benefits, their tender loving care of the property has resulted in excellent landlord-tenant relationships—some of which have lasted for decades.